Soft cottage cheese dumplings in rose, saffron, and cardamom flavoured sugar syrup. Weight: 1 Kg. Haldiram is a famous brand in India for quality sweets & snacks. Enjoy these delicious mouth watering Indian dessert at home or send them as gift on any occasion. This item in Indian Sweets category was first added to our catalog on 06-28-2017. 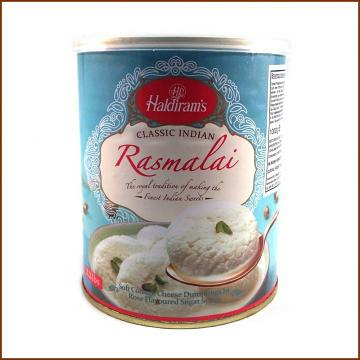 Buy Haldiram Rasmalai 1 Kg, sold & shipped by Yaadein where you can shop online for Pooja Samagri, Hindu Statues, Puja Items, Religious Gifts & Home Decor. This Haldiram & Bikaji collection has been tagged as Indian Mithai, Ras Malai, Tasty Indian Dessert Confections, Gift Pack, Order Haldiram Sweets In Usa. Large Shiv Parivar Statue w/ Shiva, Parvati & Ganesha 10.5"
I am so glad to have found desiclik.com. I am very happy with my purchase of Indian clothes for my daughter and the customer service.